Welcome to a brand new post! 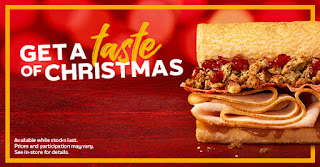 I thought that, today, I would talk to you all about the new Christmas Menu at Subway. Christmas is slowly upon us and this means, all of the food reviews. 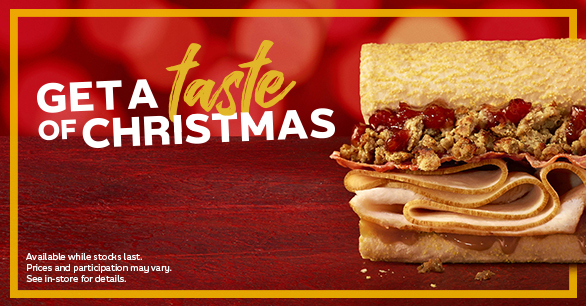 The festive season is kicking in, which means that all the lights are twinkling, the festive songs are playing, and all of the restaurants and fast food chains are revealing their Christmas/Festive Menus, to ensure that we're all getting into the spirit. I love this time of year, because it means that I can be greedy and get away with it. I always decide to go for a 9 Grain Honey Oat when it comes to bread at Subway. I just think it's more filling and I always love that sort of sweet flavour against the bread. The gravy has to be heated up separately to the Sub. I added Peppers, Onions, Sweetcorn & Gherkins to add a bit of crunch. (The debate of Pickles can be left for another time but personally I love a good thick Pickle.) I added Sweet Onion to my sandwich, grabbed a Chocolate Orange Cookie (yes, just one), and I was on my way. (I did want to try a Gingerbread Latte, but I was in a bit of a rush.) 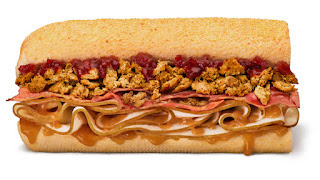 I got a footlong version of this sub, because well you've got to go big at Subway. There's no point going small with sandwiches, wheres the fun in that? The Turkey was succulent and thick. I love a good thick slice of meat. The Bacon added a slight smoky taste and added more bulk to the sandwich. 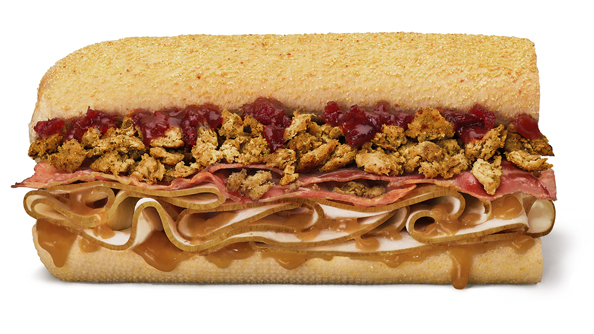 The Cranberry and Orange Sauce added a bit of fruitiness to the sandwich. When tasting it, you got a hint of Orange but it wasn't overwhelming. The Stuffing was amazing and added a bit of spice to the sandwich. In my opinion, I don't think that stuffing is ever a bad thing to add to anything. I love a good bit of stuffing. (I'm that one person at Christmas that can eat it for days.) The gravy was a weird one. I was expecting the sandwich to be swimming in it, but instead it was just a light spray but it ensured that the sandwich was soft and delicious. I also got a Chocolate Orange Cookie. The cookie itself was crispy on the edges, but so soft and squidgy in the middle. 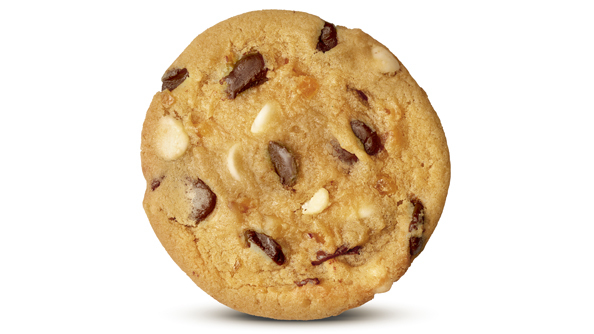 The best way for a cookie to be! The chocolate was melted so it just meant that every bite was gooey and a bit messy. The Orange flavour wasn't too overppowering, as I could still taste the Dark Chocolate in the sweet treat. I could eat five of these in one go with a nice warm inviting hot drink. Have you tried the new Subway Menu? Let me know down below! (This isn't a sponsored post, but if Subway want to collaborate with me, then, I'd be very fine with that.) I hope that you have enjoyed this post.